"She's nicer to that thing than she is to me." FilmRise has unveiled an official trailer for the film Marjorie Prime, the latest feature by filmmaker Michael Almereyda, which premiered at Sundance. This subtle sci-fi film is set in the near future in a time where intelligent AI can recreate a perfect holographic version of a deceased person. The story involves a family figuring out what to make of these lifelike recreations of people who aren't around anymore. It's a meditation on "memory and identity, love and loss." Jon Hamm stars, with Geena Davis, Tim Robbins, Stephanie Andujar, Hannah Gross, and Lois Smith as Marjorie. This seems like a cool concept, but unfortunately never lives up to its potential, and it's a very dull film. I saw this at Sundance and wanted to like it, but there's just not much to like about it. But that's only my take. In the near future, in a time of artificial intelligence: 86-year-old Marjorie (Lois Smith) - a jumble of disparate, fading memories - has a handsome new "companion" who looks like her deceased husband and is programmed to feed the story of her life back to her. What would we remember, and what would we forget, if given the chance? Marjorie Prime is both written and directed by American filmmaker Michael Almereyda, of the feature films The Eternal, Hamlet, Happy Here and Now, Big River Blues, Paradise, Cymbeline, and Experimenter previously, as well as the doc Escapes this year. Based on Jordan Harrison's Pulitzer-nominated play. This first premiered at the Sundance Film Festival earlier this year. 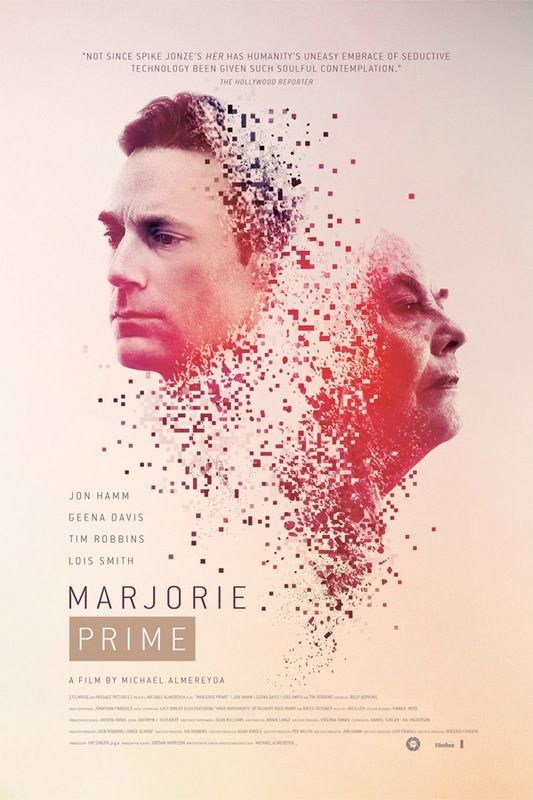 FilmRise will release Marjorie Prime in select theaters + on VOD starting August 18th this summer. Anyone interested?